Poker Dogs from Asylum Labs consists of five reels and three rows with 30 paylines that combine both slot reels and a seven-card stud poker game. In order to trigger the bonus game, you will need to land jacks or better! What’s more is that the dog that sits next to the reels will become your best friend as you play this slot because he helps you out by sneaking wilds onto the first reel every now and then! Not only this, once the dealer symbol lands in the middle reel, he will add a card to your poker hand and once all seven cards are dealt, then this bonus is activated! In Poker Dogs, there is the dealer symbol which once lands in the middle reel, it will add a card to your poker hand. There is also the wild symbol which are sneaky wilds which the dealer will throw out onto the reels to help you possibly win! Aside from these special symbols, there are five other dog symbols all represented with different characteristics and looks as well as the playing card suit symbols (Ace, King, Queen, Jack and 10). In Poker Dogs, you’ll come across several bonus features such as sneaky wilds! The dog that sits next to the reels is your best friend as he helps you throughout your time playing Poker Dogs slot. What’s so great about this little guy is that he will sometimes sneak a wild onto the first reel in order to help you win! This will occur only after a non-winning spin and when no dealer symbol appears on the reels. Each time that a dealer symbol lands in the middle reel, a card is added to your poker hand. After seven cards are dealt, five cards are chosen to make the best hand. Getting jacks or better will trigger a bonus game, however, keep in mind that all seven cards must be dealt before the bonus can be triggered. In this bonus game, cards will form into certain hands and once those card formations are completed, then awards will be given. The 3-of-a-kind bonus game will end when the busted card is picked. In this feature, the bonus will also come to an end when the busted card is selected. When Royal Flushes are formed and completed, they will be awarded in order from the first to fourth Royal Flush. The wild symbol is the highest paying symbol earning you up to 33.3x your total stake for five of a kind! The female dog character with a big feather headband is the second highest paying symbol rewarding you with up to 16.6x your total bet. The white dog that is wearing a purple hat is the third highest paying symbol awarding you with up to 10x your total bet for five of a kind while the little pup with very large ears and a moustache can reward you with up to 8.3x your total bet. The husky with bright blue eyes can reward you with up to 6.6x your total bet while the little brown dog wearing a pink bowtie and a green hat can reward you with up to 5x your total bet for five a kind. The Ace can reward you with up to 4.1x your total bet for five of a kind while the King can earn you up to 3.3x your total bet. The Queen can award you with up to 2.3x your total bet while the Jack can reward you with up to 2x your total bet. The 10 is the lowest paying symbol in Poker Dogs earning you up to 1.3x your total bet for five of a kind. Poker Dogs is taken place in a classic, dark bar with the bulldog sitting to the left of the reels and to the right, you will see a dog bartender cleaning a glass. The colours in the backdrop are simple and neutral making it easy for you to focus entirely on the symbols and cards you are dealt. You will see the poker hand being collected under the reels right above the ‘total win’ section. You’ll hear a piano playing in the background when the reels are at a standstill as well as while the reels spin or when you land on a winning combination however, additional sounds will be played as you spin the reels and land winning combinations. You can find the paytable information by clicking on the ‘I’ button that is the very bottom left-hand corner of the play screen. 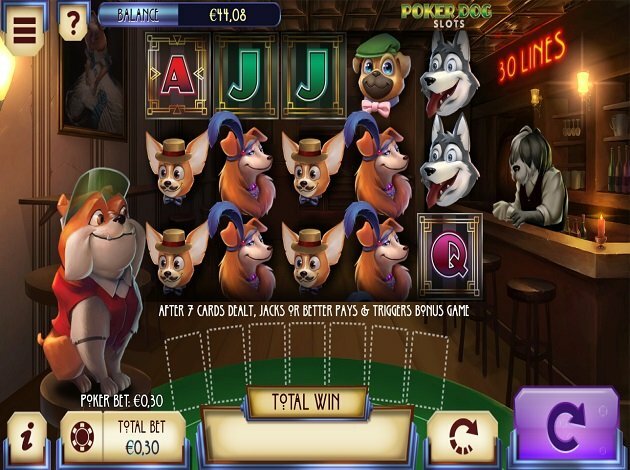 Poker Dogs from Asylum Labs is an endearing slot which offers players chances which could lead to come potential wins. This game is inspired by the card game poker but with a twist to it, as it’s a slot with bonus features circling around winning poker hands. Not only this, but the characters in it are adorable dogs which could help you as you spin the reels with the sneaky wilds. There is also the Poker Hand feature to keep an eye out for because if you land a winning pair or line, then you could also win some decent awards. Poker Dogs consists of nice graphics and a refreshing theme offering a fun experience for players of all levels. You don’t even need to be a poker professional to play this game! Beauty and the Beast is the game we currently offer at Videoslots. Try it now!